Whit Merrfield – OF – SC. 1-4. BB. Drafted by Kansas City – 9th. Blake Cooper – RHP – SC. 5IP 6H 3ER 1BB 5K. (L, 12-2) Drafted by Arizona – 12th. Bobby Haney – SS – SC. 0-3. K. Drafted by San Francisco – 22nd. Steven Neff – LHP – SC. .1IP 0H 0ER 0BB 0K. Drafted by Kansas City – 23rd. Michael Rocha – RHP – OK. 6IP 5H 2ER 3BB 2K. Daniel Black – 2B – OK. 0-3. 2K. Drafted by Florida – 14th. Steven Buechele – 3B – OK. 1-4. HR (17) RBI, K. Drafted by Texas – 18th. 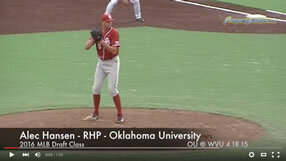 Jeremy Erben – RHP – OK. 2IP 4H 1ER 2BB 2K. Drafted by Arizona – 22nd.